. . . when I was very young, 10 or 11 years old, in the late 30's living in the Greenwood community, the Saltillo airport beacon light reflection could be seen as it rotated 'round and 'round. We lived about 6 miles from Saltillo. By the time we moved to Saltillo in 1942 the airport was gone. I believe the land that it was on was owned by Mr. Sparks. If my memory serves me correctly I was a sophomore in high school, '45 or '46, and had ridden my horse to school one day. It was recess and we saw an airplane land where the old airport used to be. I mounted my horse and rode to the location and give the pilot a ride back into town (probably a mile at most). He told me he would be flying to Sulphur Springs that afternoon to get fuel and that I could go with him if I wished (Are you kidding? I had never been up close to an airplane, much less ridden in one). I immediately accepted. That afternoon I met him and gave him a ride back to the plane. I recall, somewhere west of Weaver he buzzed some people bailing hay. The hay bailer back then was operated by a mule walking around in a circle. The hay rakes were usually pulled by a team of horses or mules. Needless to say, the horses and mules were just like me, they had never been up close to an airplane before and didn't seem to want to be then. On the way back he touched down on the highway, where there were no cars, fortunately. It was a thrill of a lifetime. I can't remember what happened when I finally got back to school. Hopefully, someone out there can tell us who the pilot was. I am quite sure he had relatives that lived in Saltillo. The pilot Joe Ben wondered about could have been "Son Jim" Rogers, son of Mrs. Stella Sustaire of Greenwood, and stepson of Will Sustaire. In 1926 responsibility for establishing a system of lighted airways passed from the Post Office to a new Aeronautics Branch. Not long afterward the Branch completed the lighting of the transcontinental airway. Enthusiasm for the new aerial highways was reflected in the 5 cent air mail stamp of 1928. The lighted airways consisted of beacon towers located at intervals of approximately 10 miles. These towers were 51 feet high, topped with a powerful rotating light. Below the rotating light two course lights pointed forward and back along the airway. The course lights flashed a code to identify the beacon's number. The tower usually stood in the center of a concrete arrow 70 feet long. A generator shed, where required, stood at the "feather" end of the arrow. Another feature of these early airways were intermediate landing fields. Federal authorities established these facilities where needed to ensure that pilots could land safely at intervals of approximately 50 miles along their route. The fields were usually co-located with light beacons. Saltillo had the distinction of having the only intermediate landing field in Hopkins County. The United States Airway Communication Station (adjacent to airfield) was equipped with a Perforator-Automatic Transmitter Distributor on the Bureau of Air Commerce Teletype network. The station at Saltillo was the tape record station for the Ft. Worth-Washington Teletype Circuit and monitored the Ft. Worth and Texarkana Radio beam and Waco, Tulsa and Ft. Worth Airway Broadcast hourly. Just west of Saltillo about a quarter of a mile on the south side of US 67 there was one of the Airway beacons. The emergency airfield, however, was not located near it, but northeast of town on the Sparks place. It also had an airfield rotating beacon. 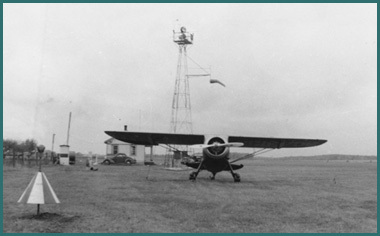 These airfields were maintained by the Bureau of Commerce (1934), as the Aeronautical Branch came to be known, on a twenty-four-hour basis with a full complement of radio operators. The man in charge of these operators at Saltillo was C. R. Carlson, a former army pilot and a member of the Air Corps Reserve. In addition to the airfield beacon there were radio sheds located nearby. Saltillo was on the Southern Transcontinental Airway on the Los Angeles-Dallas leg of the Los Angeles-New York route. 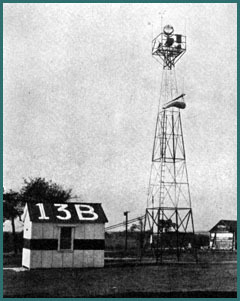 "The Evolution of Airway Lights and Electronic Navigation Aids,"
"History of Hopkins County," by G.G. Orren. 1938. Master's Thesis, Texas State Teachers' College, Commerce, Texas. Upper Left: The Airway Beacon like the one just west of Saltillo. Upper Middle: An Airway Beacon and Airfield together. 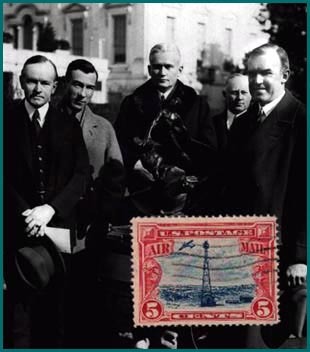 Upper Right: Government officials with the 5 Cent airmail stamp in 1928. Calvin Coolidge is on the left. Lower Right: The Low Frequency Four Course Radio Range that replaced the Airway Beacons for aircraft navigation before World War II. The United Sates Government has established an airport at Saltillo. One hundred acres have been leased from Minnow Sparks for ten years at $5.00 per acre. The land lies just north of the town on the high prairie and is an ideal place for the port. Mr. Sparks is moving fences so that work may begin at once. The entire tract is to be graded, with concrete road leading from the highway in Saltillo to the landing. A big light will be installed with sufficient power to reflect rays into Dallas on clear nights. 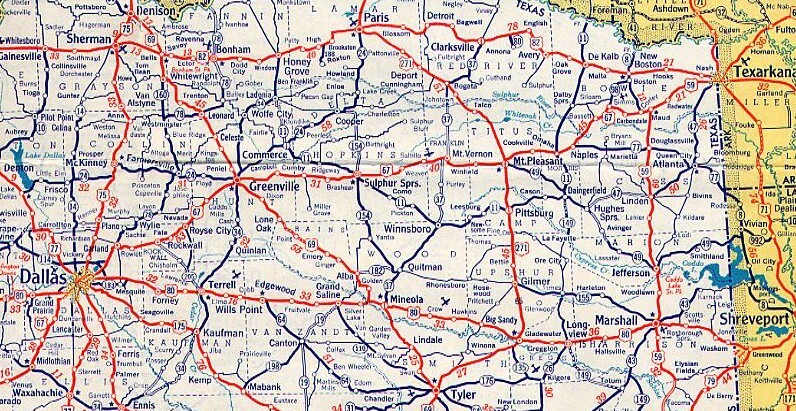 Not only has an ideal site been selected by the government, but the location of Highway 1 half way between Dallas and Texarkana makes it accessible to both cities. Government officials have been in Hopkins County for several weeks making surveys. Como offered a site and several sites around Sulphur Springs were offered, but Saltillo won out. The new port will mean much to that town. One day, a small airplane landed at the airfield and the entire second grade marched across the road to look at it. It was the first airplane I ever touched. I remember the airport and beacon several hundred yards north of the cotton gin at Saltillo. I'm sure there was a small building (station) there, but I just cannot remember what it looked like. When my brother R.L. and I used to visit the Griggs family in Saltillo (1942-1943), we played in their yard after dark. One game we played was to dodge the rotating beam from the beacon. We would hide behind parked cars or wellhouses until the beam moved past the Griggses' yard. An employee at the Saltillo Airfield from 1937 untill 1943 was John Ott. I never knew Mr. Carlson or any of the other employees. Ott married Mary Whitten, who was in my sister Fleda's high school class at Saltillo. The Otts moved to Oklahoma City in 1943. Mary died of cancer many years ago, and I suspect John is probably dead, though I am not certain. They had three children, but I do not know their first names. If you located them, they might not know much about the beacon that was once located at Saltillo. John Ott used to give children ballons filled with helium when they visited the Airfield. My parents took me and R.L. there once. The only thing I remember about the visit is taking ballons home and letting them float against the ceiling of the room where I slept. For those further interested in early commercial flight and the Airway beacons, check out the below web sites. A very informative site of early flight and the beacons. Has several pictures. The evolution of Airway lights and navigation aids. Early night flying using the Airway beacons. About Helendale, California, as an early air hub and the early Airway beacons. About an old Airway beacon that is still standing and operating, and has been for 70 years. The Mt. Pleasant Daily Times for March 25, 1931 reported that the U.S. Government paid Minter Sparks $5.00 per acre for 10 years for the use of a ten-acre plot north of Saltillo. Courtesy Bob Cowser. This is a 1938 Humble Oil Company map. Notice on it the little aircraft symbols indicating the emergency airfields associated with the beacon system of lighted airways mentioned above. A U.S. Army ambulance plane arrived at the Saltillo landing field with Col. Huttle, U.S. Army Medical Corps, for Sgt. Browning's little daughter, who had taken seriously ill while visiting relatives in this County at Pickton. The plane took off at 3:55 p.m. with Mrs. Browning and her daughter for Randolph Field in San Antonio, where the child entered in Govt. Hospital at Fort Sam Houston. Sgt. Browning left for Randolph Field via automobile. This was the first instance of the kind at Saltillo landing field, so is important locally.